Yahoo! It's going to be an exciting day. 1. Wohoo for Yahoo: Shares in Yahoo (YHOO) are surging by about 8% premarket based on a report that the firm is considering selling its pioneering Internet business after failing to turn it around. The Wall Street Journal reported on Tuesday that Yahoo's board will meet several times this week, during which the company's directors will consider whether to sell Yahoo's lucrative stake in Alibaba (BABA), the company's core Internet business, or both. 2. Stock market overview: U.S. stock futures are looking firm Wednesday following a Tuesday rally. 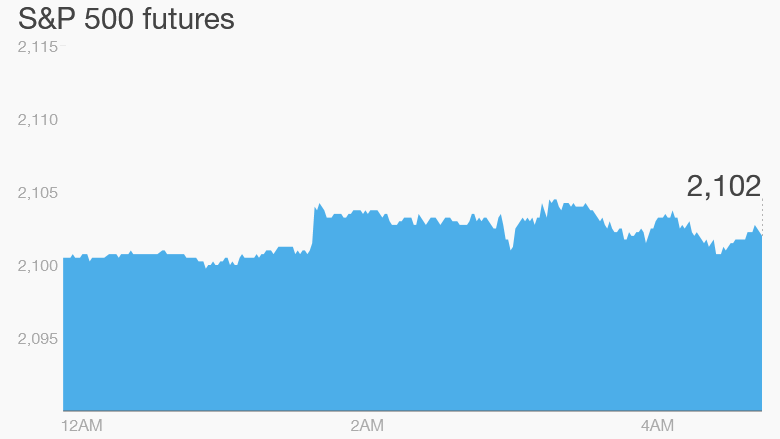 The Dow Jones industrial average, Nasdaq and S&P 500 each jumped by about 1% over the previous trading day. Over in European markets, the mood is positive and most of the main indexes are edging up in early trading. 3. Economics: The head of the Federal Reserve, Janet Yellen, is scheduled to speak today at 12:30 p.m. ET at the Economic Club in Washington, DC. Investors and economists alike will be monitoring her talk to glean more information about her views on the U.S. economy and her plans for future interest rate hikes. The latest Fed Beige Book will be released at 2 p.m., giving detailed information about the state of the U.S. economy. Investors will also be watching for the November ADP employment report at 8:15 a.m. If the ADP data is better than expected, this will be the latest sign that the Fed will raise rates before the end of the year, said FXTM analyst Lukman Otunuga. Additionally, the weekly crude oil inventory report will be released at 10:30 am ET. 4. Earnings: The Royal Bank of Canada (RY) and Brown-Forman (BFA), the company that makes Jack Daniel's whiskey, will post quarterly results before the open. After the close, a number of retailers will be reporting results, including Aeropostale (ARO), New York & Co (NWY) and PVH (PVH), the parent company behind Calvin Klein and Tommy Hilfiger. 5. Another baby pic on Facebook: A lot of office water-cooler talk will focus on Facebook (FB) today after the company's co-founder and CEO Mark Zuckerberg announced plans to give away 99% of his Facebook shares to celebrate the birth of his new daughter, Maxima Chan Zuckerberg. He will keep his majority stake in Facebook, and thus voting control, for the foreseeable future. Money from the shares, currently valued at $45 billion, will go to projects and charities that advance human potential and promote equality. Zuckerberg and his wife Priscilla Chan announced the plan on Tuesday. The donations will take place over their lifetime.